My location and timing were not ideal. They never are. You just have to play the hand you are dealt and proceed accordingly. I was exploring an unfamiliar area near my new deer stand. I like to do this sort of thing in the off season since (i) it is fun and (ii) a lot can be learned about game trails, movement patterns of animals, etc. without spooking the game closer to actual deer season. Plus, it was a beautiful, cool morning and snakes and chiggers were low on the list of concerns due to the temperature. Behind this stand is the thinner end of a gully. As this gully heads north to a creek about 1/4th of a mile away, it is joined by other small gullies like a network of veins meshing their way back to the heart. Heading north, I hit one of these minor gullies and turn east, simply watching and listening. The wind is good considering the direction I'm forced to walk in. Take 2 steps. Look for a snake. Step over a log. Listen. Smell. Look. The closer I moved towards where the minor gully joins the main gully, the thicker brush grew. I'm having to stoop down, crouch and generally duck-walk my way through small, open pockets in the brush. As is typical, I walked through several spider webs. Like cockroaches, for every one you see and avoid, there are probably 10 others you did not see. No big deal; they are just spiders. As I stand up to survey for a way, any way, to cross the complex of gullies, the brush about 30 yards away starts teeming with activity. I had stumbled upon a group of sleeping hogs who were now on the hoof, confused and moving slightly away through the thickness. I crouch down, listening, watching. Twice I have the rifle at my shoulder looking for a clear shot, the scope capturing branches, leaves and patches of moving black fur. Twice I lower the rifle, not desperate to try to thread a bullet through the brush and wound or lose an animal. Beside, I'm not entirely sure how I'd recover the animal if I were able to kill it in this mess. A leaf brushes my ear. It tickles a bit and I brush it away with the back of my right hand. A few minutes later, crouching and listening, the leaf hits my ear again. I brush it away more aggressively this time. This is distracting and I really need to keep movement to a minimum. I lean forward away from an unseen bush behind me. I'm simply waiting, listening, thinking and daydreaming. ... it is now actually hot enough to worry about snakes and chiggers. ... I should have left my jacket on the 4 wheeler. ... what pictures might be on my game camera card by my new deer stand? ... I should have eaten breakfast. ... what might be causing the battery drain in the red truck? ... what chores am I going to tackle when I get home from "playing in the woods"? My mental state is then interrupted. The leaf is back at my ear. But this time, something is different. This time, it jumped onto my ear. It is amazing how fast you can simultaneously change mental focus and spring into action. I violently reach up and whip the hat off my head. To my surprise, the leaf is not a leaf at all but a large, brown spider about the size of a nickel. It was desperately trying to find a way off of my head and my ear was a convenient launch pad to a nearby branch. I had been chasing it back onto my head with each swipe. This was probably enough movement for the hogs to get the message I was, in fact, not a cow. They were never seen or heard again. "So how did you get a hog AND a rabbit?" Well... you just never know how an "average" day in the woods will turn out. The hunt started off like most hunts... the promise of a new day in the woods transitioning into quiet yet slight boredom. I start by the bridge heading behind the pond, downstream of the creek, heading towards the river. Slowly, slowly moving just listening and looking. It is so beautiful in there. One of my favorite places. A few ducks landed in the pond to my right. Other than that, it was surprisingly quiet. At about 8:10, I finally saw a squirrel. The .308 in my hands might be a bit overkill so I keep inching along. I'm slipping down a tight trail which had ranged from 10' to 2' wide. To the right is a heavily overgrown field that is thick with vines and brush, limiting visibility to about 15'. To my left is a steep drop-off overlooking the creek/river bottom. The edge is about 20-30' away and is too steep to comfortably or safely climb. I'm creeping along, covered in head-to-toe camo, trying to not make any noise when the brush around me erupts. Hogs. 4 of them. About 100lbs each. They had been bedded down, overlooking the drop off. They seem to like these sorts of high points. Wind was negligible so at least it was not working against me. The quartet moves a few feet. They saw something but had no idea what I was and are obviously confused. I pull the rifle to my shoulder and while doing so, apparently breathed DIRECTLY into the eyepiece since the scope was completely fogged when I looked through it. There is a hog RIGHT THERE, broadside, at ~10 yards and all I can see are two shadowy, dark images. I look again, lower the gun, bring it back up, aim the best I can, .... and fire. Hogs explode in all directions and for a split second I'm afraid they are coming my way. I start to reach for the 9MM on my hip with the intention of just jettisoning the long gun. Now they are turning, heading for the really thick stuff to the right. At least I'm not being charged. The next two shots are more by feel than anything. I'm not even trying to look through the scope but am just pointing and shooting the best I can. I think, but am not 100% sure, the 2nd shot was at the lead hog. It might be hit but keeps running. 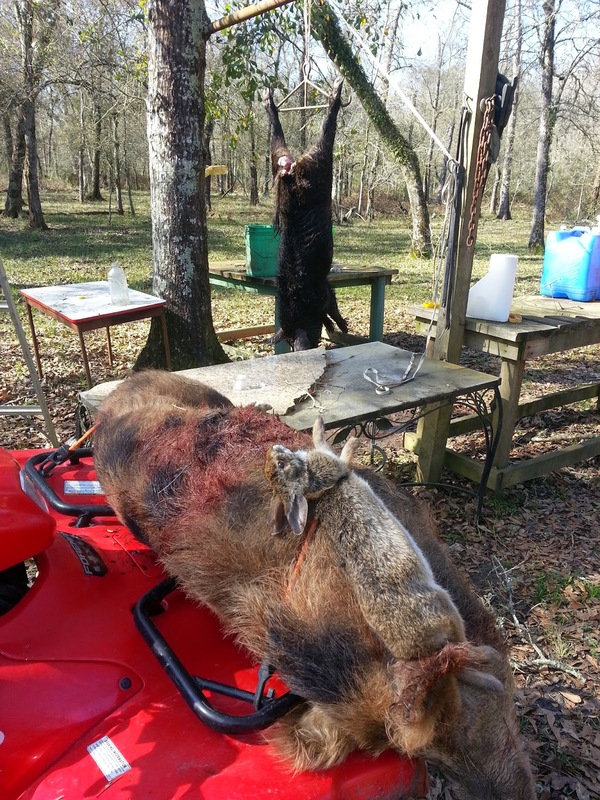 The 3rd shot is at the first hog I shot, bringing up the rear of the pack, wounded. She is going slow with a broken right leg and a hole through her sternum. The 3rd shot hits her a little far back but takes out the lungs. She goes down and dies quickly. The above took place in a matter of ~2 seconds yet felt like 2 minutes. It is amazing how tunnel vision kicks in when the adrenaline hits and you can take in and process a million little things at once. After the shaking stops, I gut hog #1 and glance at the map on my phone to get a feel for where I am. Continuing on the trail, I eventually hit a larger trail that runs parallel to the river. While walking the 2 sides of the 1/4 mile long triangle back to the 4 wheeler, a big hawk takes off about 50' away. He had been on the ground. Curious, I ease closer to see what had his interest. There, in the grass, is a still warm, cottontail rabbit, deader than a hammer with just a small mark on his side and head. I started to take the rabbit but realized this was the hawk's breakfast so I put it back. After getting the 4 wheeler and proceeding to get lost in the field only to have to abandon the 4 wheeler to find the hog and ..... the rabbit was still there after an hour. Realizing that possession is 7/10th of the law, I strapped the rabbit to the 4 wheeler and headed back to camp. .... and THAT is how I happen to come back to camp with both a hog and a rabbit.